The first half of the first episode introduces our human protagonist, along with his quirks and personal struggles. As the title suggests, he finds a cat. After some awkward interactions with the cat, the second half of the episode shows the same events from the cat's point of view, with inner monologue. This appears to be the formula for the show - you see from his point of view, and then you get the cat's perspective. It's the tale of a man and his cat, neither of which fully understand humans, who will help each other discover what it means to care for someone completely different from yourself. On the sweet side. So the new level of waifu is... Neko Waifu? Solid first chapter. gives just enough backstory to understand the social anxeities of the main protagonist, some basic relationships, a good, likable pair of side characters that provide good balance and the voice of the kitten also gives a nice turn with some really hard feels. That said, the series looks promising, a sort of fantasy slice of life with a lot of potential and I think it will be a must for every cat person out there. Maybe for dog persons also. Extra points for the detail of the cat behaviour and the design, which looks with a lot of personality. It was surprisingly wholesome yet cute at the same time. Subaru only cares about books and writing. One day, he discovers a cat who cares for his well being. It creates a very heart warming interaction making the story more lively than expected. The dialogue for the cat was a very nice touch. Looking forward to the various cats and animals within the story. This anime is a near perfect blend of cute antics interspersed with heart-wrenching moments. Within the first episode, I was already invested in the story and wanted to see how Subaru and his cat came together. By the second, I knew that this would be an anime I would watch in its entirety. And by the end of the third episode, I was genuinely crying as Subaru looked through the scrapbook. I love the way that the first 2/3 of each episode focus on Subaru's perspective as he struggles to interact with the outside world he can no longer ignore, while the last 1/3 is from Haru's perspective as a cat, unable to fully understand the human world and struggling to communicate with her new caretaker. It gives the idea that our pets might be smarter than we realize, possibly even knowing things we don't. And of course, I can't forget to mention the OP which is just pure joyful cuteness given physical form. Oh, wow. We have a winner. Three episodes in and my rating has gone from a 3 to a 4, and now, to a 5. Looks like I've found another anime to add to my Blu-ray / DVD disc collection. One that I can turn to for viewing again and again. I'm not going to spoil things by going into plot and storyline details. Just watch. I'm willing to bet it will capture your heart by the end of episode 3, if not sooner. Only two episodes out but I'm already in love with the show!!!! Subaru is so socially awkward that its adorable (as well as painfully relatable) and seeing Haru's perspective on everything is a lovely touch. Also how Haru gets her name is so sweet and hilarious. Looking forward to following this through the entire season! This isn't usually the type of anime I would prefer to watch. I gave it a try anyways. My initial thought was... wow, this is some serious slice of life I'm getting into. The main protagonist is an anti-social writer who keeps himself busy by reading and writing his own books. He comes across a cat in which he eventually keeps. The plot is very simple but sweet. There are moments where I want to cry and moments where I'm happy af. It's cute and I would recommend this anime for anyone. 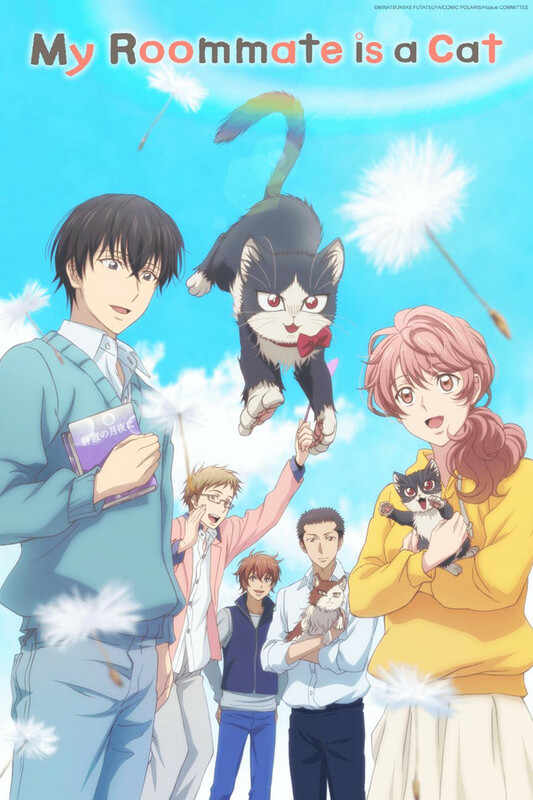 This is a wholesome show about a young socially awkward author grieving from the loss of his parents who befriends a little stray kitty - the show's format is split into a first-half being his perspective, and the second-half being the cat's perspective. The human character perspective is generally pretty realistic while the cat perspective anthropomorphizes the animal's inner monologue and occasionally introduces minor supernatural elements as a way to explain the bizarre things pets sometimes do. As the sympathetic human protagonist struggles with his own personal demons of anxiety, grief & inattention to his own well-being, the kitty starts to evolve into something of a protective therapy animal. It's a lovely formula made better by the generally wholesome supporting cast. The original manga it was based on is worth checking out too - much how the anime is structured, it actually divides the entire story chapters into the human and cat perspectives. The cute fan service we deserve. Perfect for cat and animal lovers alike. This is an adorable anime that has me hooked after one episode! Cannot wait to see what this anime has in store. The multiple perspectives are interesting and the voice acting is spot on. This show can be relatable, sad, and hilarious. Haru is just the most adorable thing, and Subaru is too funny. The two make an incredible duo and a great plot with fantastic conflict. I just can't get over how much I love this anime! I'm too hyped for when every Wednesday comes around. I need more of this lovable duo.